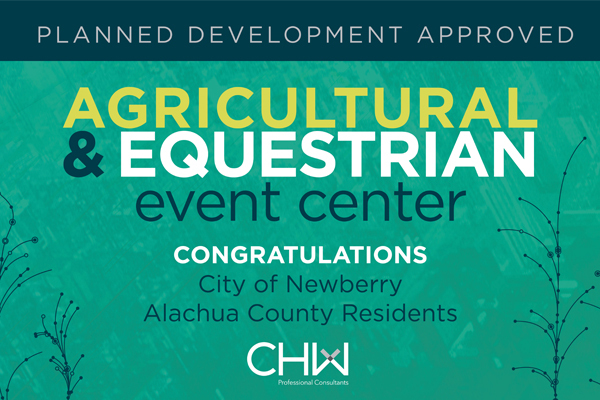 Congratulations to the City of Newberry and Alachua County residents on the Planned Development (PD) approval for Alachua County’s Agricultural and Equestrian Event Center (Canterbury Showplace), in Newberry, Florida. The approved PD ensures that the site’s intended use as the Event Center is consistent with onsite permitted uses and signifies that Alachua County citizens are one step closer to realizing a first rate agricultural and equestrian event center of up to 160,000 square feet of non-residential space. The Agricultural and Event Center will accommodate many types of events that enhance the quality of life, inform the public on may topics, supply entertainment, and increase local business profits.